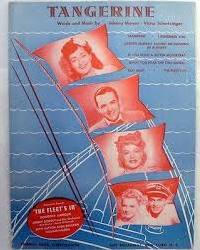 “Tangerine” was written for the 1942 movie The Fleet’s In, which starred Dorothy Lamour, William Holden, Eddie Bracken and introduced Betty Hutton. The Jimmy Dorsey Orchestra, with vocalists Helen O’Connell and Bob Eberly, made a very successful recording in 1942. “Tangerine” was recorded in July 1995 and released that year on Here’s To The Ladies. The song is in tribute to Helen O’Connell. It was arranged and conducted by Bill Holman.